Police in Los Angeles are concerned about the city's growing number of medical marijuana dispensaries - especially when it comes to them preying on our nation's precious youth. This Halloween season, the L.A.P.D. 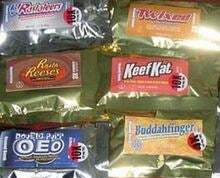 are of the belief that terrifying pot heads are going to accidentally (or not accidentally) give your kids products like Keef Kat (which looks like Kit Kat), Reefer's (Reese's), and 3 Rastateers (3 Musketeers). That's because everyone knows that people who pay a lot of money for medical marijuana love to give it out for free. It's just a thing they do because it's is so cheap and money grows on trees! Plus, getting kids' high is hilarious. Okay, that last part is definitely probably true. The Los Angeles Police Department today issued a warning about these retail-look-alike candies and asked parents to be vigilant and sort through tonight's haul just in case. Cannabis candy seized by LAPD narcotics detectives was put on display during a press conference today in which cops urged parents to be careful about their kids' trick-or-treat loot. Is this really a for real concern for parents? I'm genuinely curious. Because I can say with 99.99995 percent certainty that nobody is trying to give away their 3 Rastateers for free. And if they are, I woulda already known about it and been there twice (jkjk) (more like three times) (jkjkjkjk) so everybody chillll.